Justin Bieber’s got nothing on this guy, who, incidentally, is probably old enough to to be the Bieb’s dad. “It only works if the top matches,” noted the fashionista, who takes his style cues from Teen Scene, when an elderly lady commented on the lovely lavender shade of his shoes. 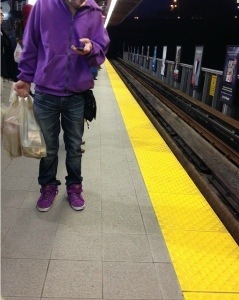 From this SkyTrain platform it looks like spring has sprung, in this man’s wardrobe, at least. You know what makes your sarcasm so respectful? The fact that you deliberately hide the face of the individual. Lovely, simply lovely. I am your biggest fan.